Offield Farms and Lingh.nl are pleased to announce the third Shoot to Win Photo Contest at the Rolex FEI World Cup Dressage Finals April 15-19, 2009. Everyone is invited to submit his or her photo that best captures the magic of the event. Photos can be of the performance or behind-the-scenes. The winner will receive $500. In addition, a matching donation of $500 will be made to the equestrian charity of the winner’s choice. Past contest winners include Mary Cornelius with her joyful photo of Daniel Pinto reacting to his win along with the thunderous crowd. 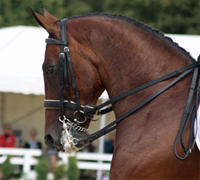 Pinto was the winner of the 2007 Rolex FEI World Cup Dressage Grand Prix Freestyle B-Final. Terri Miller won the first Shoot to Win contest in 2005 with her photo of Anky van Grunsven riding Salinero during an impromptu return to the ring after their victory lap. There is no entry fee for the photo contest and both amateurs and professionals are invited to participate. All photos from the 2009 Rolex FEI World Cup Finals will be considered. Simply submit your photo (two photos maximum) in JPG format along with your contact information to dressage@offieldfarms.com. Not going to the World Cup? 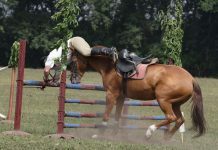 Enter your best horse photos from anywhere in the world in Horse Illustrated’s 2009 Photo Contest. Previous articleHI Spy: Does Your Horse See a Boogeyman on the Bridle Path? Can’t wait to see the pics – thanks for the link! This is a great idea for a contest. They should do that sort of thing more often. I love the photo for this article.